Big Fat Muppet Update | Critical End! Don't freak out, it's totally consensual. That’s pretty much what we’ve been hearing with some great new details on what the disbanded Muppets are up to at the film’s beginning. You’ll also note that the release date has been moved form Christmas to Thanksgiving, meaning you’ll get your Muppet fix a full month earlier. In bittersweet news, Paul Rudd has squashed the rumor that he’s voicing Segel’s puppet pal Walter. Bitter because we all love Paul Rudd, but sweet because my preference is for Muppeteers to voice Muppets. It’s the natural order of things. Of course it’s still possible they’ll go for a celebrity dub job to pull in a broader audience. It’s also possible that Celebrity Dub Job would make a great title for a gameshow. 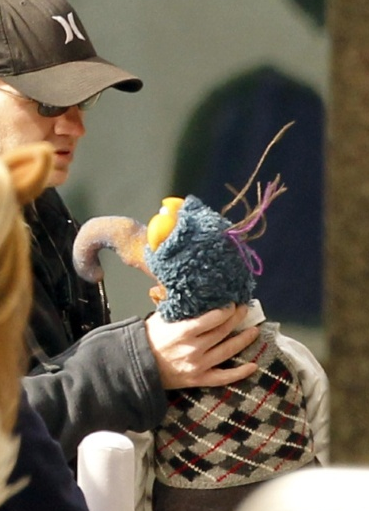 Last thing, Muppet Central linked some sneaky set pics posted at On Location Vacations. They’re guaranteed to satisfy all your dour-looking-gentleman-manhandling-Beaker needs. This entry was posted on Saturday, December 11th, 2010 at 1:18 pmand is filed under . You can follow any responses to this entry through the RSS 2.0 feed. Both comments and pings are currently closed.